For information on any of these Bahr drives, please contact us. Fast, accurate and repeatable positioning systems that improve productivity, Bahr positioning systems are modular, flexible systems made with self-supporting, wear-resistant aluminium profiles.Designed and manufactured by Bahr in Germany, and supported and distributed in the UK by Quin, these profiles are available in different sizes: 30mm, 40mm, 60mm, 100mm and 125mm. Bahr offers a wide range of guide a drive systems to match the dynamic and load requirements, as well as the path and positioning accuracy of your application. Contact us, and we will be happy to help you select the best model for your needs. 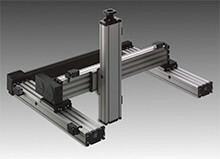 We recommend and use Bahr positioning systems because of their superior design and manufacture. Precise attention to detail on both the slide and the carriage ensure smooth running and a long lifespan. Find out more by visiting the Bahr product pages, or contacting us today.